For most of us, even envisioning a trillion dollars is difficult to do, a few more zeros than we are used to seeing in numbers. 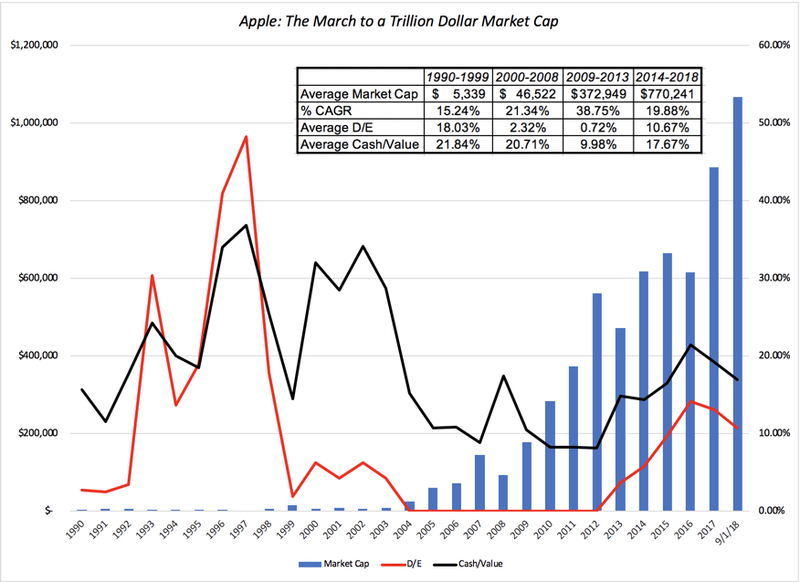 Thus, when Apple’s market capitalization exceeded a trillion on August 2, 2018, it was greeted with commentary, and when Amazon’s market capitalization also exceeded a trillion just over a month later on September 4, 2018, there was more of the same. I have not only admired both companies, but tracked and valued them repeatedly over the last twenty years. There is much that I have learned about business and finance from both companies, and I thought this would be a good occasion to look at how these two companies got to where they are today, as well as their similarities and differences. 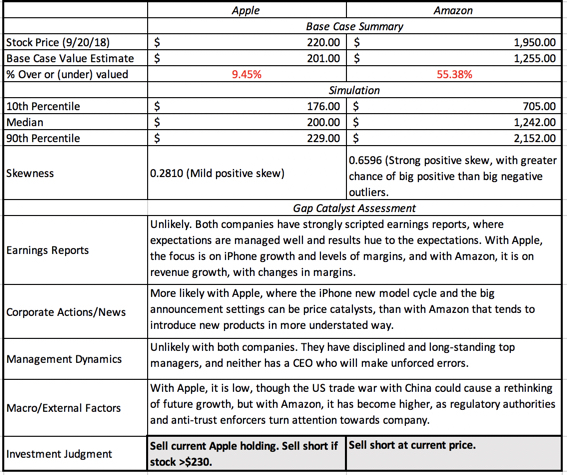 In the process, I will make my assessment of where Apple and Amazon stand today, and update my valuations and investment judgments on both companies. 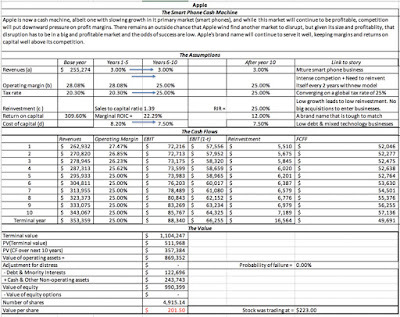 I am sure that your assessments will be different, but it is of these differences that markets are made. Markets give and markets take away, and this is true not just for the laggards in the market, but even the most successful companies. 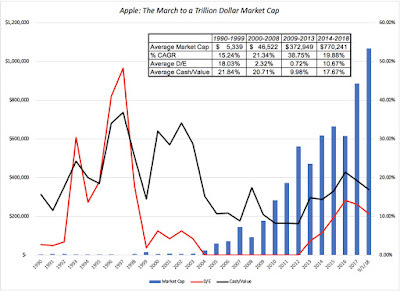 Apple and Amazon have had amazing runs, but without taking anything away from their success, it is worth noting that during their march towards trillion dollar market capitalizations, each has had to endure periods in the wilderness, and the way they dealt with market adversity is what has made them the companies that they are today. After its auspicious beginnings, Apple endured a decade in the wilderness in the 1990s, after the departure of Steve Jobs, its visionary but headstrong co-founder, in 1975, and a series of inept successors. As testimonial that there are sometimes second acts for both people and companies, Apple found its mojo in the first decade of this century, headed again by Steve Jobs but this time with a stronger supporting cast. That success has continued into this decade, with Tim Cook stepping in as CEO, after the untimely demise of Jobs. In the last few years, the company has also chosen to use its capacity to borrow money, increasing its debt ratio from close to nothing to just over 10% of equity (in market value terms). 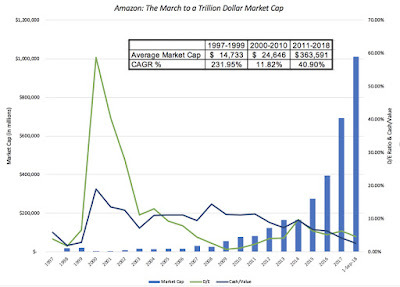 From a barely registering market capitalization in 1996, Amazon zoomed to success during the dot-com boom, but as that boom turned to bust, the company lost more than 80% of its market capitalization in 2000. After its near-death experience in 2000, Amazon spent the bulk of the following decade, consolidating and getting ready for its next phase of growth, increasing its market capitalization almost eight-fold between 2012 and 2018. We can debate whether Amazon and Apple are worth a trillion dollars, but there can be no denying that both companies have been successful in their businesses, and that it is these operating success that best explain their high market values. That said, as we will see in the section following, the way these companies have evolved over time have been very different, and looking at the pathways that they used to get to where they are, I will lay the foundations for valuing them today. The revenue growth rate, which languished in the 1990s, zoomed in 2000-08 time period, and operating margins almost doubled. 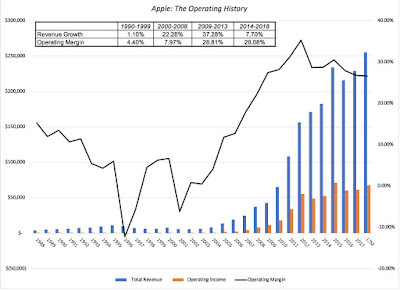 However, it was in the 2009-13 period that Apple saw the full benefits of its rebirth, with operating margins almost quadrupling, with the iPhone being the primary contributor. During the 2014-18 period, the good news for Apple is that margins have stayed mostly intact but it has seen a fairly dramatic drop off in growth, as the smart phone market matures. The company's growth was stratospheric in the early years, partly because it was a start-up, scaling up from less than a million dollars in revenues in 1995 to $2.76 billion in 2000. While scaling up did slow down growth, the company weathered the dot com bust to grow revenues at 28.61% a year from 2000 to 2010, with revenues reaching $34.2 billion in 2010. The most impressive phase for Amazon has been the 2011-2018 period, because it has been able to continue to grow revenues at almost the same rate as in the prior decade, but this time with a much larger base, increasing revenues to $208.1 billion in the last twelve months, ending June 2018. On the income front, the story has not been as positive. 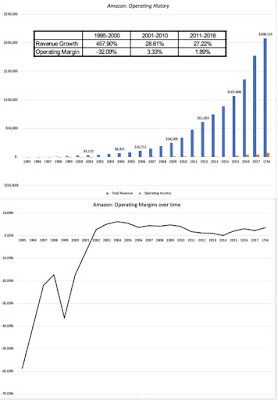 While the initial losses in try 1990s can be explained by Amazon's status as a young, growth company, it becomes more difficult to justify the continuation of these losses into 2002 (six years after its public listing) and the trend lines in operating margins since then. 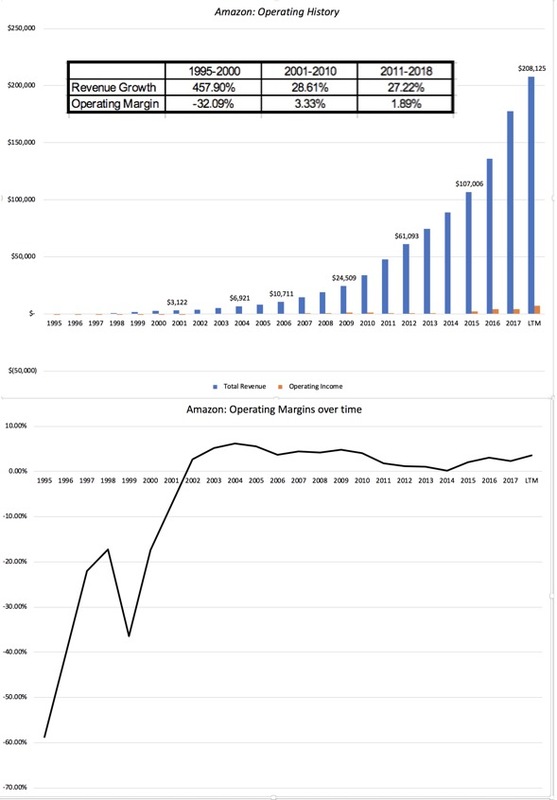 Rather than improving over time, as economies of scale kick in, which is what you would expect in growth companies, Amazon's margins have not only stayed low but have often headed lower, suggesting either that the company is not reaping scaling benefits or that it is playing a very different game, and my bet is on the latter. 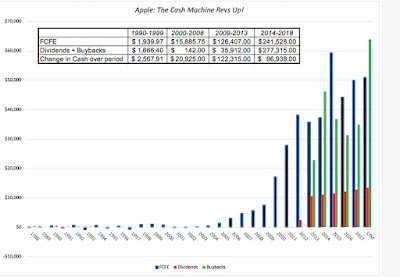 I have described Apple as the greatest cash machine in history and you can see why, by looking at the cumulative cash flows generated by the firm. After getting a start in the 2000-08 time period, the cash machine kicked into high gear between 2009 snd 2013, with $124 billion in free cash flow to equity generated cumulatively over the period. 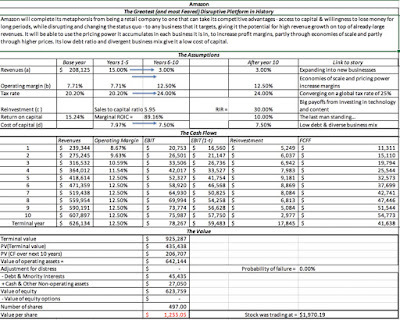 You can also see the company's initial reluctance to return the cash, both in the fact that only about a third of the cash flow during this period was returned in dividends and buybacks and in the increase in the cash balance of just over $122 billion. Prodded by activist investors (Einhorn and Icahn, in particular), the company switched gears and began returning more cash, increasing dividends and buying back more stock. Between 2014 and 2018, the company returned an astonishing $277 billion in cash to investors ($61 billion in dividends and $216 billion in buybacks), which is higher than the $242 billion that the firm generated as free cash flows to equity. 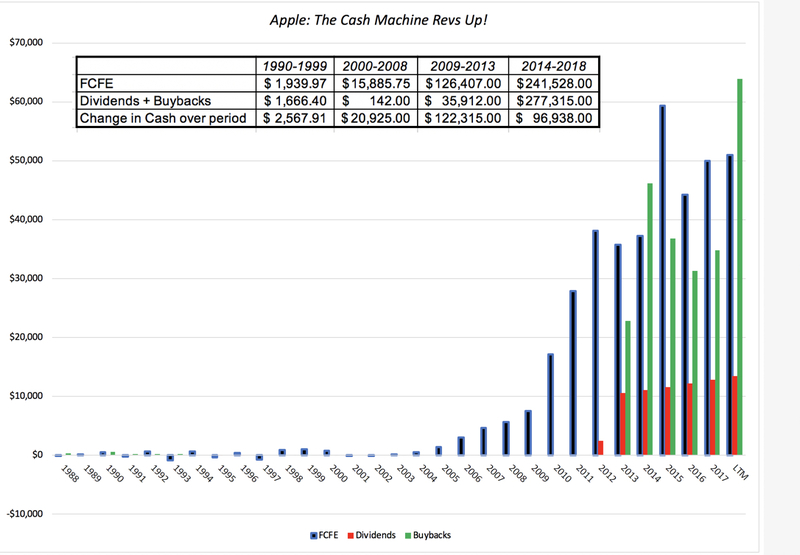 While it was returning more cash than any other company has in history, Apple pulled off an even more amazing feat, increasing its cash balance by $96 billion, as it used it dipped into it debt capacity, to borrow almost $100 billion. It is not the negative FCFE in the early years that is the surprise, since that is what you would expect in a high growth, money losing company, but the evolution of the FCFE in the later years. 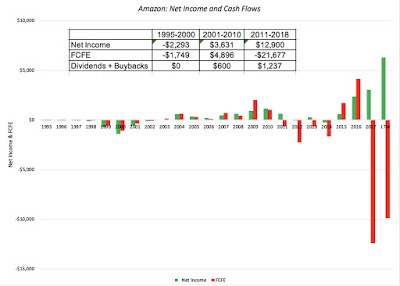 Initially, Amazon follows the script of a successful growth company, as both profits and FCFE turn positive between 2001 and 2010, but in the years since, Amazon seems to have reverted back to the cash flow patterns of its earlier years, albeit on a much larger scale, with huge negative free cash flows to equity. During all of this period, Amazon has never paid dividends and bought back stock in small quantities in a few years, more to cover management stock option exercises than to return cash to stockholders. 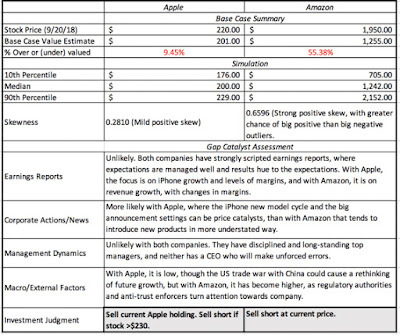 With the historical assessment of Apple and Amazon behind us, it is time to turn to the more interesting and relevant question of what to make of each company today, since Apple and Amazon are clearly are on different paths, with very different operating make ups and at different stages in the life cycle. 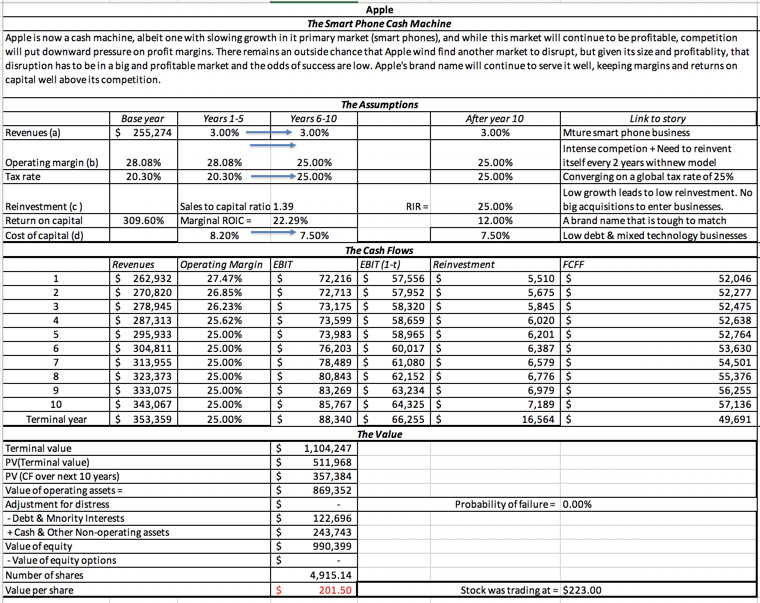 Apple is a mature company, with low growth, and is behaving like one, returning large amounts of cash to stockholders. Amazon is not just a growing company, but one that seems intent on continuing to grow, even if it means delayed profit gratification. In the section below, I will lay out my story and valuation for each company, with the emphasis on the word "my", since I am sure that you have your own story for each company. 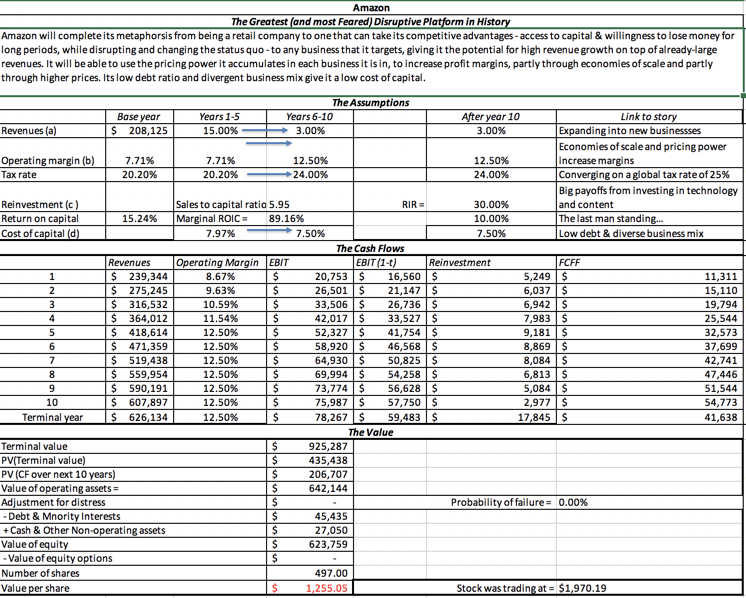 I will leave my valuation spreadsheet open for you to download, with the story levers easily changed to reflect different stories. 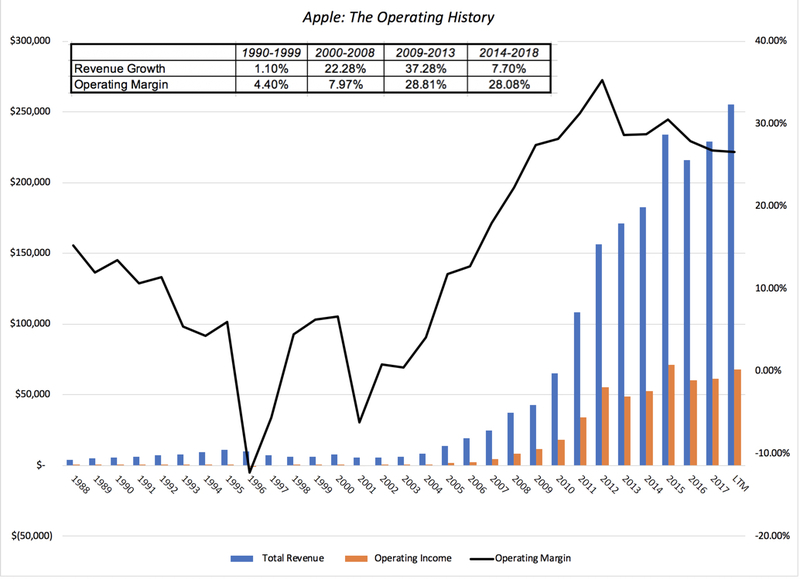 Apple's success over the last two decades has been largely fueled by one product primarily, the iPhone, and that success has come with two costs. The first is that Apple is now predominately a smart phone company, generating almost 62% of its revenues and an even higher percentage of its profits from the iPhone. The second is that the smart phone business has not only matured, with lower growth rates globally, but is intensely competitive, with both traditional competitors like Samsung and new entrants roiling the business. 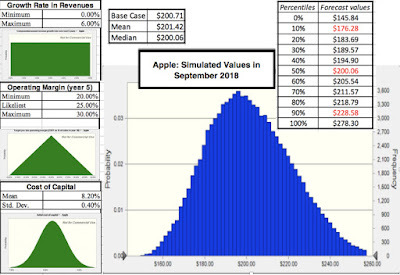 While there remains a possibility that Apple will find another market to disrupt, I think it will be difficult to do so, partly because with Apple's size, any new disruptive product has to not only be of a big market, but one that is immensely profitable, to make a difference to Apple's cash flow stream. My story for Apple is therefore relatively unchanged from my story last year, though I am a little bit more optimistic that Apple will be able to use its immense iPhone owner base to sell more services. I am valuing Apple as a mature company, growing at the same rate as the economy in perpetuity, while seeing its operating margins decline from their current level (30%) to about 25% over the next 5 years, and with these assumptions, I estimate a $200 value per share, roughly 9% lower than the $219 stock price on September 18, 2018. 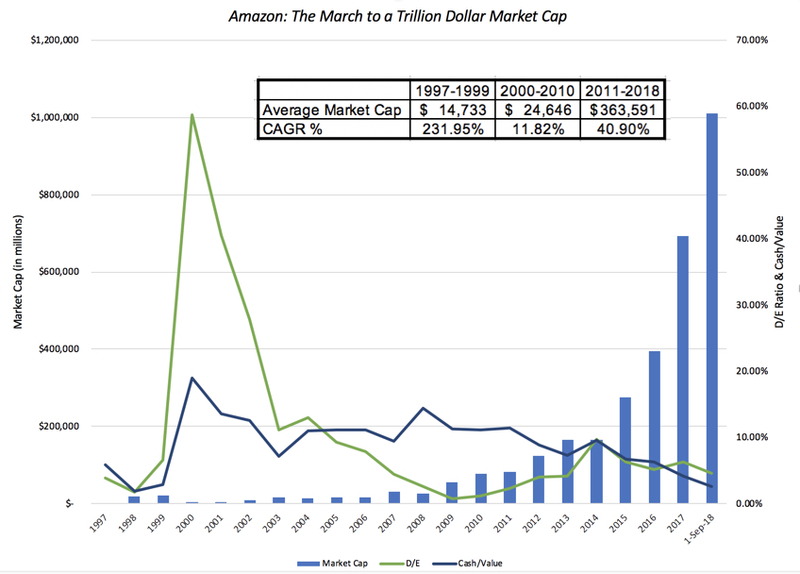 In my earlier valuations of Amazon, I called it a Field of Dreams company, because investing in it required investors to buy into its vision of "if we build it (revenues), they (profits) will come". In my most recent valuation of Amazon, I noted that the company was finally starting to deliver on the second half of the promise, increasing its profits margins, with its cloud business contributing large profits, and significant investments in logistics keeping shipping costs in check. Along the way, and especially since 2012, the company has also moved from being predominantly a retailer of goods and services to one that is unafraid to enter any new business, where it can use its disruptive platform to good effect. In effect, it has seemed to have transitioned from being a disruptive retail company to a disruption platform that can be aimed at other businesses, with an army of Prime members at its command. My story is that will continue to do more of the same, with high revenue growth coming from new businesses and markets and a continued growth in margins, as established businesses start to find their footing. 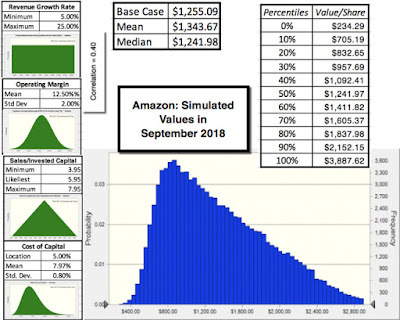 My revenue growth rate of 15% may seem modest, given Amazon's growth rate in the last decade, but note that if this growth rate can be delivered, Amazon's revenues will be $626 billion in 2027, and if it can improve its overall operating margin to 12.5%, its operating profit will be $78 billion in that year. With this story, I estimate a $1,255 value per share for Amazon, well below its market price of $1,944 a share, making it over valued by almost 35%. I will admit, with no shame, that Amazon is a company that I have consistently under estimated, and it is entirely possible, perhaps even plausible, that the real story for Amazon is even bigger (in terms of revenue growth) and more profitable. I have always operated on the premise that if you value companies, you should be willing to act on those valuations. In the case of Apple and Amazon, that would suggest that the next step that I should be taking with each company is to sell. With Apple, a stock that I have held for close to three years and which has served me well over the period, that would be accomplished by selling my holding. With Amazon, a stock that I have not held for more than five years, that would imply joining the legions of short sellers. Like an Avengers' movie, I am going to leave you in suspense until my next post, because I have two loose ends to tie up, before I can act. The first is to grapple with the uncertainties that I have about my own stories for the two companies, and the resulting effects on their valuations. The second is what I will mysteriously term "the catalyst effect", which I believe is indispensable, especially when you sell short.